Arsenal manager Arsene Wenger admitted he was "relieved" after his side reached the FA Cup final by beating Championship side Wigan Athletic on penalties at Wembley. The Gunners won the shoot-out 4-2 after the game ended 1-1 following extra-time. That puts Arsenal in sight of their first trophy since they won the FA Cup in 2005. "I am relieved because we were under great pressure. 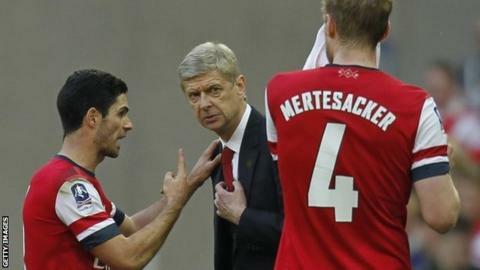 I expected a difficult game and I was not disappointed," Wenger said. "Wigan were very impressive, well-organised and physically very strong but we were at the level of mental strength I expected. "It was important we didn't go out tonight because the consequence of it would have been quite worrying." Jordi Gomez's 63rd-minute penalty opened up the possibility of sending holders Wigan to another FA Cup final, but Per Mertesacker's equaliser eight minutes from time gave Arsenal the opportunity to face either Hull City or Sheffield United in the final. Arsenal started the last-four tie in fifth place in the Premier League and out of the Champions League places after Everton's 1-0 win at Sunderland, but Wenger is still confident they will overhaul Roberto Martinez's side, who are now two points ahead. "I didn't even know Everton's result," said Wenger. "I think if we win all of our games we will finish in the top four, so it is important now to focus on the Premier League. "I am confident we will come back. We have a target in the FA Cup final but now we have a period where we can concentrate on the Premier League. "Wigan showed why they knocked out Manchester City in the quarter-final, and for a period we had everything against us, but we showed some character, resilience and nerve to do it."